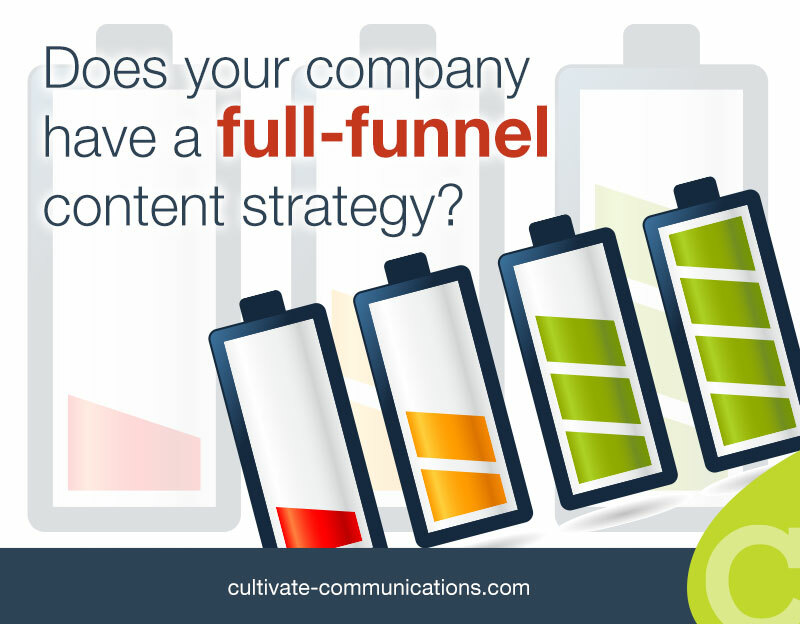 Does your company have a full-funnel content strategy? Do your sales and marketing teams have a full funnel content strategy – a process for moving your ideal prospects from awareness to consideration and acquisition? An effective content strategy isn’t just focused on inbound marketing – generating leads to fill the top of the sales funnel – which is where many B2B marketers focus the majority of their efforts. Why? Because it feels natural for them to do so; after all, they’ve been doing it for decades. In contrast, a full-funnel content strategy includes content aimed at prospective buyers at all points of the sales funnel. This includes the critical but often overlooked middle of the funnel, where 90 percent of the “nurturing” must take place to move a prospect from interest to preference and a sale. Nurturing is the process of moving a prospect through the sales funnel by providing them with content that is tailored to their informational needs at each point of their product research and selection process. In the process, it establishes trust and ideally positions your company as a valuable resource to them. Ultimately, the goal of nurturing is to move prospects until they are ready to buy. It even extends beyond the point of sale, because customers continue to have information needs after they have purchased a product. Without a plan for nurturing, content goes to waste, ignored by prospective customers, who don’t understand how it applies to their needs. Sales leads also go to waste, because salespeople don’t want to spend their time talking to prospective customers who are not yet ready to buy. Prospects may receive a single phone call or two from a salesperson. But once he or she determines that the prospect is not ready to buy, this lead and numerous others like it will simply be ignored. That’s too bad, because with even a modicum of structured nurturing, many more leads could be turned into sales. Growth Cycle Marketing is Cultivate’s proprietary process for establishing, nurturing and building a relationship with each prospect at every stage in their buyer’s journey, even before that individual buys anything from you. But building a relationship isn’t about attracting just anyone. You can attract your ideal customer with the right content and targeted messaging. An ongoing, interactive relationship generates leads, filters out ideal customers, bolsters your sales pipeline, and over time builds brand trust and customer loyalty. Content purpose: Educational, instructional. Support prospects in the information gathering segment of their customer journey. Content types: Blog posts, viral videos, infographics, an informative website, guides, e-books, checklists, templates, white papers and presentations. Content purpose: Help prospects get answers to their questions. Provide proof of thought leadership and that your company has the solutions to their problems. Content types: Brochures, spec sheets, case studies, testimonials, reviews, webinars and calculators. Content purpose: Serve up catalysts that will encourage the prospect to buy. Content types: discounts, free trials, assessments, audits, demos. Content types: Training materials, manuals, parts catalogs, service bulletins. Content purpose: Keep them happy and coming back for more, whenever they have needs for the products and services you offer. If possible, help them be successful in other parts of their business. Content types: Newsletters, loyalty programs, excellent customer service, solicit testimonials and case histories from them. To get the full scoop on Growth Cycle Marketing, click here.